Its been a busy week guys. Between emergency turkey roasting, filming with Parents and Friend’s and Art Explorers in the garden, Americorp work days, and newborn Nubians, (I promise pictures and blogging will happen when I’m more alive) it’s been a lot of work out in the cold. My household is sick. It’s been going around. Its been forever since I had a bug, but I’m all foggy and have a scratchy throat. The Kid is sick, and so is The Boyfriend. 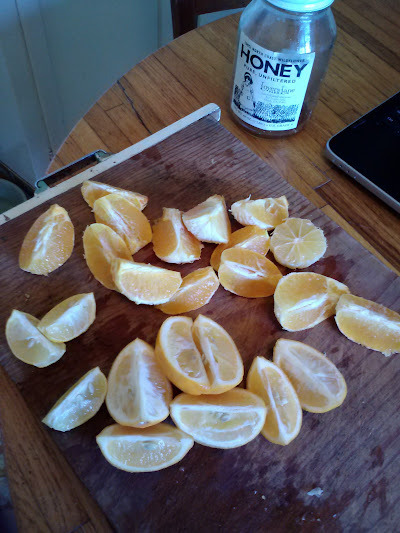 We’ve been saving our orange peels in the fridge in a tupperware for a few weeks- since Sarah found local oranges, of all beautiful things, in Ukiah. Citrus is so precious I couldn’t bring myself to throw them away. I first thought I might candy them like my grandma used to, but honey works so differently than sugar I wasn’t sure it would work, and thought it might just make napalm on my baking sheet. Then I remembered marmalade. I had made a nice fluffy farmer cheese, and had been eating it in tiny custard cups with honey because I felt too exhausted and gross to cook. 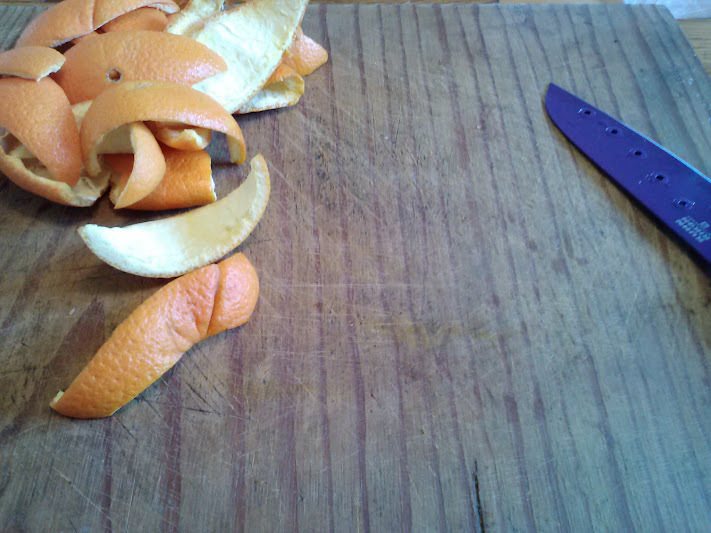 The clean, bitter citrus taste is all I ever want when I’m sick, and I was feeling up to the task of sitting and cutting peel into bits, so I did. Initially I brought my laptop and watched the Lorax, but it made me too sad, so I had to watch Wallace and Gromit instead. 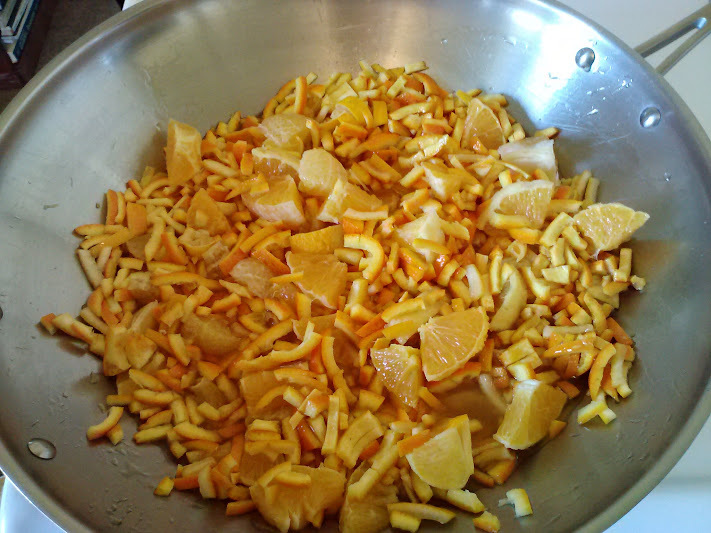 I also cubed some fruit- both a few oranges and some meyer lemons from Sarah’s parents’ tree that were getting a bit soft. 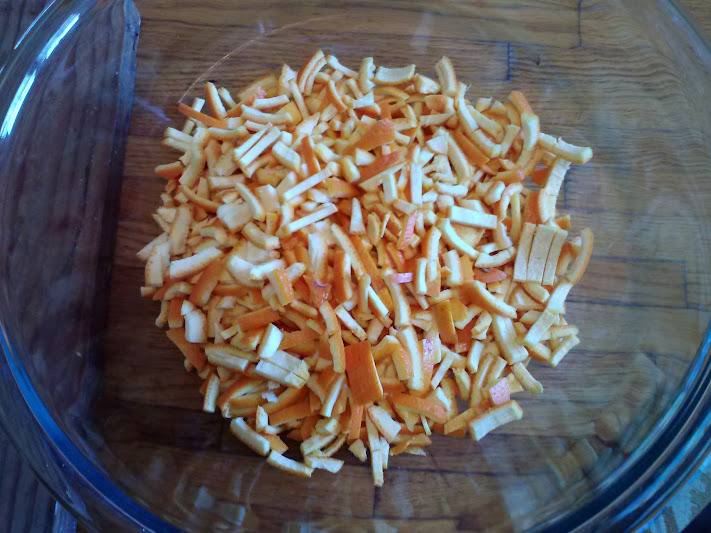 Some recipes call for the pith to be removed entirely, because it is a bit bitter, and some for the pith to be removed, wrapped in cheesecloth, and left in for the natural gelling effect it has. 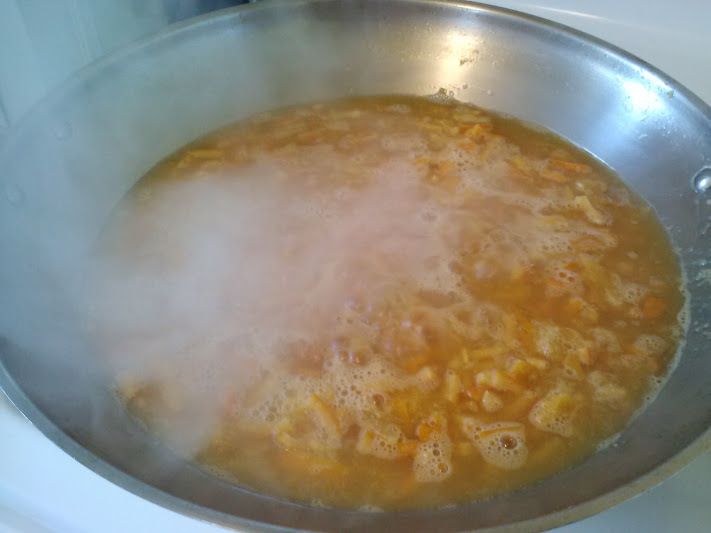 (its full of pectin, which occurs naturally in some fruits like quince and to a lesser extent apples, and is sold in powdered form for jelly making) I happen to like bitter marmalade, which is lucky because I was not in any way up for the removal or straining process. I added about a cup on honey- which is a bit less than the usual amount of sugar. 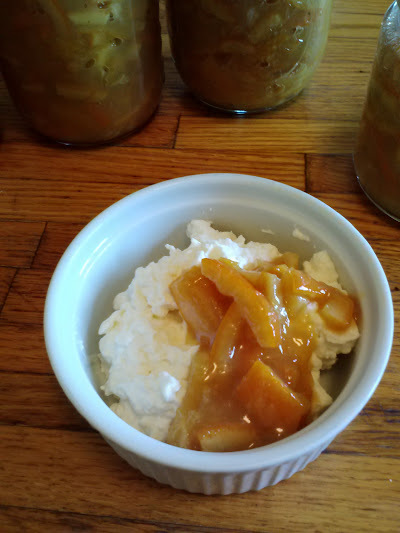 Sarah’s lemon sauce taught us a lot about replacing sugar with honey- its sweeter, and thinner. Hence the sauce instead of curd. Since I left the pith in I did add a fair amount. 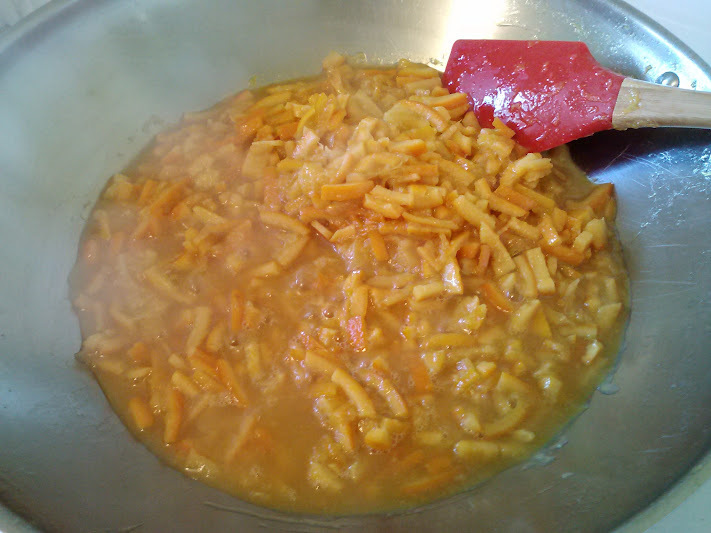 The oranges cooked down for a long time- over an hour. I added little bits of water as I went to keep it simmering. Eventually it began to gel a bit even though it was hot, and I figured that meant it was done. This stuff smells amazing even when you can’t really smell anything. Spooned over the thick rich farmer cheese, its absolutely what I want today. Hope you and yours are warm and keeping hydrated. I’m sure they would keep a couple weeks, but I bet we’ll eat it way before that! 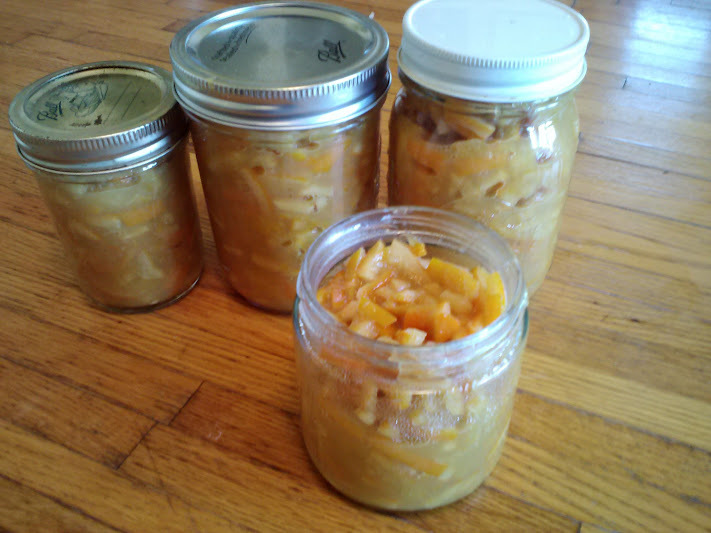 I’m refrigerating them, since they’re just in jars, not pressure canned. I hope we’re all better soon, I just came in from putting the goats to bed and am ready to drop. 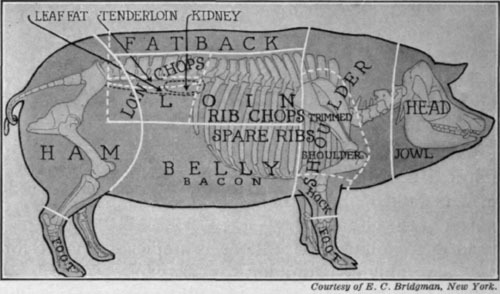 Hope you’re all well soon, it is going around as you say. Only fair if everyone gets it! I wonder what it would be like in a tart? And they do make sugar out of beets- I know beets will grow here (not sure about sugar beets, though, which are different than the ones we eat). Hope you feel better soon, it is a NASTY bug that is going around. HUGS! Hope you are well….I am curious about coastal oranges – know anyone growing them here? I’m in Point Arena and have seen a couple trees that are reputed to produce – but no one knows the variety. Lemons do well, but I wonder if you or any readers can suggest one to try! I enjoy your blog and FB postings – such a righteous endeavor!